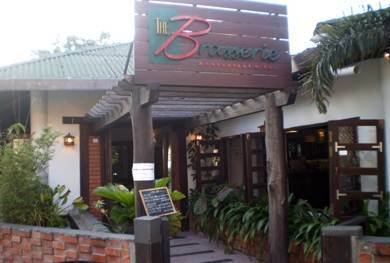 The best part of The Brasserie is its location which is complemented with nice choices of Mediterranean food. Located right on the Pantai Cenang Beach, it has both indoor and outdoor seating areas. But the returning guests mostly come early and take up the outdoor seats with covered roof, particularly the outdoor sofa lounge which are both right on the sand. One of the coveted features here is the magical view of the sunset over the Andaman sea. But sometimes you might need to tolerate the overexcited guests coming and standing in front of you taking pictures and blocking part of the views. But that's okay, the overall ambience remains wonderful. They put on a romantic background music as well. 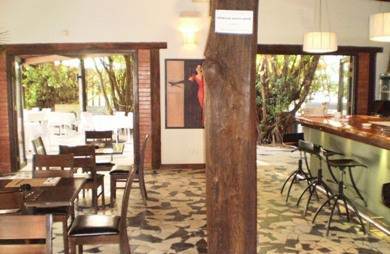 The inside seating has wooden chairs and tables in front of the bar. The bar area has vintage French posters and also a large screen TV. 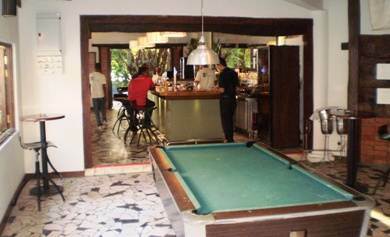 And next to the bar is a pool table. There is also complimentary internet access. The restaurant belongs to Lorenzo who also owns another top class restaurant L'Osteria in Pantai Tengah serving authentic Italian cuisine. If you had dined in L'Osteria, you will perhaps like to dine in Brasserie as well hoping to get another quality ambience and food. We weren't disappointed at all, you won't be either. The chef Rennie is skilled enough and takes delicate care as he prepares the delectable food. In fact right before the main entrance, you will find a small blackboard where the Chef's Specials for the day are written with a chalk. Brasserie actually uses special and select set of ingredients in its cuisine like extra rich olive and imported chilled meat etc. After you place the order, you will be first served with breads & bread sticks with olive. Some of our favorite dishes here includes steaks, grilled seafood, fish and pasta dishes. During lunch they serve more casual fares including pastas, burgers & sandwiches etc. The dinner menu starts from 6pm onwards. This is one place where you will get Pumpkin Ravioli which is rare to be found elsewhere in the island. It is marinated with salmon in a lemon cream sauce. In starters you can try items like fish soup, mussels or Caesar salad. Although the restaurant does not have many choices for vegetarians, one of the great options is to go for Greek salad as starters and pasta with spicy arabitta sauce as the main course. You can accompany your dinner with some wine or beer. One of our favorites here is the Sangria... it's a white wine served with fresh cut fruits. A bottle of Hoegaarden Beer costs RM7. In desserts, our first choice would be caramelized banana crepes served with coconut ice cream. It's fantastic! The dessert menu also includes pineapple tart tatin, blue berries cream brulee, Sicilian Cassata semifredo with candied fruits etc and another exotic item... marinated strawberries with strawberry ice cream and strawberry sauce. If you are having your dinner outdoor, it may appear to be a bit dark outside although they put on small electric lanterns or candles on the table. The service is friendly and quite efficient. Portions are quite okay but the food is a little on the pricier side. With drinks, starters, main course and desserts, you will likely spend about RM200 for two persons. There is a barbecue and buffet every Sunday. Daily 12noon to 11:30pm. The Kitchen closes at 10:30pm. It's located at the Cenang beach behind the restaurant Tomato Nasi Kandar.